As a budget grower myself, I appreciate low cost value whenever I buy LED grow lights. They can get expensive if you don’t know what to look for. I started out growing with LED’s back when they were a bit pricey. With recent technological innovations there are a number of cheap LED grow lights that are half as expensive and are hundreds of times better then grow lights of yesterday. Looking For Cheap LED Grow Lights That Won’t Break The Bank? This step is not that easy but sticking with full spectrum is a must. Otherwise you are switching out your LED’s for a new another light source which means you have to purchase more lighting which drives up cost and also is a pain to reset your grow tent and the fixtures within your grow space. Keep it simple and use one light that provides the wave lengths your plants love. Growing your own cannabis can be more addicting than smoking it. That being said as you start to grow more and more, chances are your grow room and need for more lighting will increase. This will cause your budget for LED grow lights to increase. Daisy chaining LED grow lights is a great solution to keep the expenses down and keep your LED grow lights cheap as far as cost goes. A daisy chain LED light simply means that you can string up your grow lights and connect them using a power cable. This eliminates the need for extra electrical outlets and reduces energy costs and drain. Many grow light manufacturers keep the cost down on their LED’s by using cheap bulbs in their grow systems. Not always a horrible thing as it does keep things cheap. 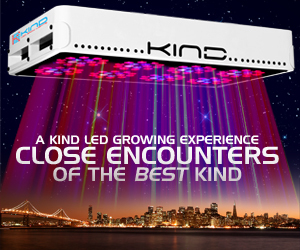 It is possible to find great LED’s with less expensive grow lights like the Advanced Platinum Series LED Grow Light. This is one of many companies I recommend for their cheap but effective grow lights. Not that the bulbs won’t last, because they will, but cheaper bulbs tend to spread out to a point were they become less effective, thus using more energy and dollars to get the grow you want. Your LED lights are all typically full spectrum but should also have a way to easily switch between veg led lighting and bloom. Making this easy is vital. Re-arranging your lighting can be difficult once all your plants have grown tall and proud. Do your research. Check out LED grow light reviews. You can always gauge of a product such as lights for growing marijuana by listening to what others say. This is the reason we built this website. So you can read great, real life reviews of the products you are interested in buying. When ever I am looking into buying LED’s I always divide the dollars by Wattage. The lower the ratio the better. This is not the ultimate determining factor when buying an LED grow light kit but tells me a lot about the value of the lights I am considering. Lastly, you will want a light that is easy to setup, adjust and handle while going through all stages of growing. One main factor in this, does the lighting come with adjustable hangers or do you need to purchase a lighting ballast for your lights. If so, this will drive the overall rice up. Bad for those who want to grow affordably. Advanced Platinum Series P150This light is a bit more pricey up front but the PAR per dollar ration is fantastic. This will save you money on the back end as you finish growing. VIPRASPECTRA 450 WATTThis is a great and easy to use light that also has a good price tag as far as cheap led lighting for growing goes. Fantastic 12 bandwidth full spectrum lighting that stays constant and spreads evenly over your grow operation. Mars Hydro 144 LED Grow LightWe recently reviewed this light and were blown away! Such a cost effective little light that brings big grows to small spaces. Also great for beginner grow farmers. We want to mention the Mars Pro Series 2 Epistar 80 for its versatility as a full spectrum grow light and it’s affordability. If you are a grower on a budget, it is worth checking out. We recently reviewed the Mars Pro 2 Epistar 80 and were blown away by its functionality along with its ability to create a great yield in a tiny space. We hope you enjoyed this insightful guide on purchasing cheap LED grow lights and wish you a happy grow season!